Do you think we will get to a point where you reference the movie "The Exorcist" and younger generations have no clue what you are talking about? Nah, I don't think so either. It's a classic horror film, like Psycho or Texas Chainsaw Massacre. Maybe one day they'll try to film it again, since it was such a success the first go around, but either way, I think the original will always be known. The movie is quite unique in its scary factor. There isn't someone chasing after you with a knife; there's no plot to kill. Instead, a demon has decided to take up occupancy inside of a little girl. The not-so-religious family has to seek their faith in God by finding a local priest to perform an exorcism to remove the bad spirit from her body. 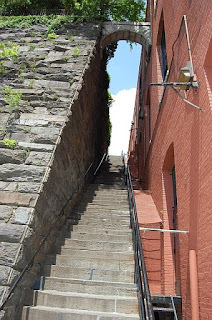 I won't give any spoiler alerts, in the off chance that you haven't yet seen it (and if you haven't, go rent it now, or make sure it is on the schedule for next Halloween's movie marathon), but everyone remembers the Exorcist stairs. Located just next to the Georgetown University campus, the Exorcist stairs actually maintain quite the popularity. Mostly they are visited by those in their fitness gear, looking for a workout. And man, I'll tell you from experience, going up and down the stairs, even just three times, will give you quite the racing heartbeat. Start at the top or the bottom, either way, you'll definitely get your workout in. The stairs also mark as a useful passageway between the busy Key Bridge/M Street and the Georgetown University campus/residences. So, they do actually serve a purpose other than appearing in films or making you sweat. Next time you are in DC in Georgetown, swing by and give them a try. You will have that much more respect for them once you've conquered the climb.